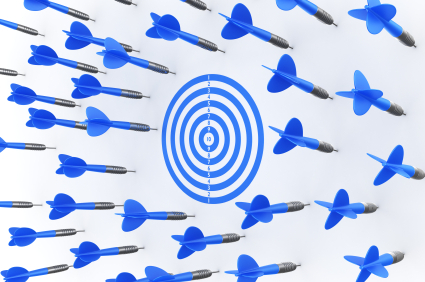 8 Responses to Off-target: Do lawyers have a choice? In 10 years in private practice (Top City firm, Top 10 national/international firm, Top 100 regional firm) I didn’t hit my annual billable/accountable time target once. I can count on the fingers of one hand the weekends that I worked in that time. That’s why I never made Partner. Hitting those targets is only possible if (1) the firm supplies you with enough work or you are able to generate enough work and (2) you want to do that much work. Being in the position of (2) being a choice is a great luxury – it means you are in an excellent firm where they appreciate that not everyone wants to make Partner but can value your work enough to keep you, at least in part because you have enough peers who want to generate work for others. If you are in a firm where (1) is not true and the combination of your personal ability to market and the brand value and routine caseload of your firm are insufficient to generate the work to let you hit targets you’re in the wrong job/firm. I spent 14 years in practice. I met my targets every year from memory, and in one memorable year billed in excess of £340,000 (not bad from someone based in Plymouth – not bragging, honest). I only ever got two bonuses. The largest was £1,500, the other a few hundred pounds. But frankly I couldn’t care a jot about bonuses. I came from a direct sales background and if I thought I was going into a profession that prized reward over doing the very best job possible for the client (lawyers exist to serve – period) then I wouldn’t have gone within a Country mile of the profession. Ask yourself what would motivate you more: to do the very best job for the client or get a bonus? As to the work/life balance, law is long way behind other sectors and is built still on a ego based culture where it is seen as the norm to work long hours. For me it is about delivering results, and you should easily be able to have a life without killing yourself. If you can find a firm that prizes client satisfaction (to WOW the client pure and simple) over billing then you will be doing very well. Don’t get me wrong. I understand the need to make profit but by following this line all the time, you will never achieve the full potential of the firm or the people that work within it. “Do law firms read things like that and think, “maybe we should reduce our targets slightly”? Perhaps lawyers themselves need to take that stand before the firms will drop the target levels, if indeed they are too high.” I suspect that in the big commercial firms this would be simply impossible; sliding scales may remunerate those working longer hours but ultimately the more they work, the more goes into equity partners’ pockets. And in legal aid practice the remuneration is so low lawyers now have to work flat out just to stay still. Good thought though.It shouldn’t have to be like this. Julian – the thing is, in my experience a lot of firms are now heavily focused on sales, particularly and unsurprisingly the firms that are looking to grow. My experience is that, at least in commercial firms, whatever they say about quality, client care, excellence in service, other than perhaps the top 6-7 firms the number one valued skill is sales ability. Being of a suitable general standard of legal ability and flair is a given – it is very hard to differentiate firms on that basis and even where clients recognise your or your firm’s excellence in a field, if that was what they were principally interested in they’d go straight off to Slaughters (or another luxury brand) regardless of cost. It is a change in the profession – and partly driven by a welcome recognition that the provision of legal services is a business rather than something a client is privileged to pay for – and needs to be recognised as such. Thankfully I’m now at a firm where business development/sales/client relationship management are entirely separate from provision of legal services and it is rather a liberating experience! Clients pay on a day rate – there are no targets, you do and are paid for the days you work, work is provided for you. If the client gives you more work, it is an opportunity to sell another person in, not for you to do longer hours – you get a referral bonus for identifying this. Depends what you mean by sales. Do you mean selling? There is a critical distinction between growing a practice – the classic rainmaker – and someone who can sell. How many closes do lawyers know off by heart? How many prospect every day? Just not realistic to expect. Excellence is a massive differentiator. The issue of service came up in more meetings than I care to remember. Trouble is the word has been lost in a slew of nonsense which has ameliorated its effect. I agree that selling is important but more should be done on developing client skills before casting people out to knock on doors. Service and excellence are important – doing them below par will surely lose you work and clients. Doing them excellently doesn’t win you nearly as much as doing it badly loses. Reaching unobjectionability is the aim for many, particularly as the standard of unobjectionability continues to rise. hopefully in your new job you will find yourself given a target that has been designed to be achievable. Frankly, even if trainees don’t have targets you should start the way you mean to go on and set yourself one. They are a useful way of measuring what you are achieving and possibly understanding where you may not be getting a balance between work, sport and marketing quite right. The linking between bonuses and targets has become a problem for exactly the reason your friend gave. If you’re going to pay extra for target achievement, the management sets the targets out of range. You would wouldn’t you. That means that they are no good for managing and monitoring performance any more. it’s a US law firm that has missed the point not you. Nobody ever has done so !! !